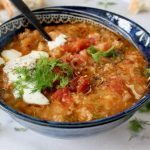 This unstuffed cabbage rolls soup with chicken and rice in a tomato broth is the ultimate weeknight hack on the classic stuffed cabbage rolls recipe, only with half the prep work and without sacrificing flavor. 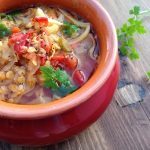 Easy, healthy and tasty, it can be done on the stove top or slow cooker! As much as I recognize the charm of stuffing cabbage leaves with minced meat and rice for Sunday supper like grandma used to make, you still can’t beat the Tuesday night alternative of throwing everything together in one pot and enjoying the same textures and flavors in no time. So today we are going to learn how to make unstuffed cabbage rolls as a soup, or served as a casserole. The only difference is how much liquid you are going to use. This is definitely the kind of soup or stew intended to feed a crowd, or at least provide you with lunches to go for a couple of days. I started by sautéing a large leek in some olive oil until almost caramelized (you can use a large onion instead), then added the ground chicken or Italian sausage, my spices, san Marzano canned tomatoes with the puree, and a mix of both fresh cabbage and suerKraut. If you were wondering where the magic of stuffed cabbage rolls comes from, it is a combination of the sauerKraut and fresh cabbage, and the mandatory fresh dill and caraway seeds. You could also cook the rice in a separate pot, but then again you’d be cheating yourself out of some fantastic flavors that the rice absorbs when it is being cooked in the broth of the unstuffed cabbage rolls. Who wants that, right ?! Where did stuffed cabbage rolls originate ? 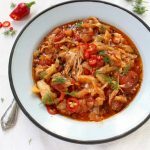 When seasoning your unstuffed cabbage rolls soup, make sure to wait until towards the end, as the sauerKraut you use will determine how much extra sea salt your dish needs. You might not want to add any at all, so keep that in mind. 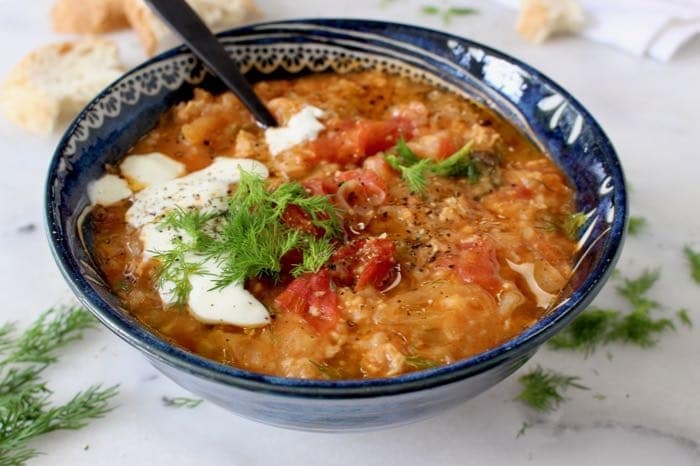 This unstuffed cabbage rolls soup with chicken and rice in a tomato broth is the ultimate weeknight hack on the classic stuffed cabbage rolls recipe, only with half the prep work and without sacrificing flavor. Easy, healthy and tasty! Cut the leek lengthwise. Discard the tough dark green leaves and slice the white and pale green parts of leek. Place and wash them in a bowl of cold water. All all the grit to fall to the bottom of the bowl, and using your hands scoop out the leeks and place them on a tea towel to drain. 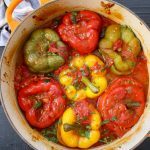 Heat up the olive oil in a large enameled cast iron pot on low flame. Add the cleaned leeks with a pinch of sea salt and sauté for about 20 minutes until they start to caramelize. Stir in the caraway seeds and toss to coat in the oils. Add the ground chicken or Italian sausage to the pot and break it up with the flat side of a wooden spoon. Cook for a few minutes then stir in the fresh cabbage. Cook on low for a few minutes until it starts to wilt. Add the sauerkraut to the pot together with the peppercorns, San Marzano tomatoes with the puree or Passata, and half of the fresh dill. Use the wooden spoon to break up the tomatoes If they are whole. Season with the sea salt and cover with the filtered water. Bring to a simmer and cover with a tight lid. Cook together for 20 minutes. After 20 minutes have passed taste for seasonings, stir in the rice, cover with the lid and cook on low for another 15 minutes. Remove from heat and allow it to sit covered for 10 minutes. Serve warm with sour cream on top, a drizzle of olive oil and sprinkled with fresh dill and freshly cracked black pepper. Add all of the ingredients to a large slow cooker bowl and cook on low for 6 to 8 hours, depending on your slow cooker. We call them Pigs in The Blanket instead of stuffed cabbage. Hubby’s family is German and they love sauerkraut. I make a soup that is similar to this with hamburger. Great recipe. It looks delicious. I am having a bowl of these leftovers for dinner. I’m convinced it tastes even better than yesterday, and I’m never stuffing cabbage again. Unstuffed cabbage rolls are my new best friend, thank you for the fantastic recipe, we are proud to report we all wiped our bowls clean. This looks incredible. I LOVE the flavor of stuffed cabbage, but I will admit that I’m almost always too lazy to actually stuff them. I am definitely making this tonight. It’s the perfect rainy day meal!! 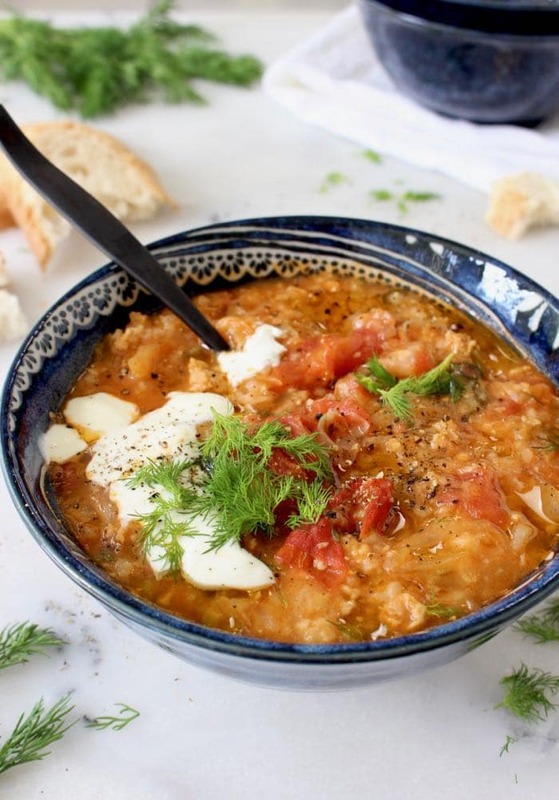 Florentina, I don’t think anyone else could make cabbage soup look so delicious! The Florentina special is how I want to make it– super delicious. I think the soup version is just perfect for the season! 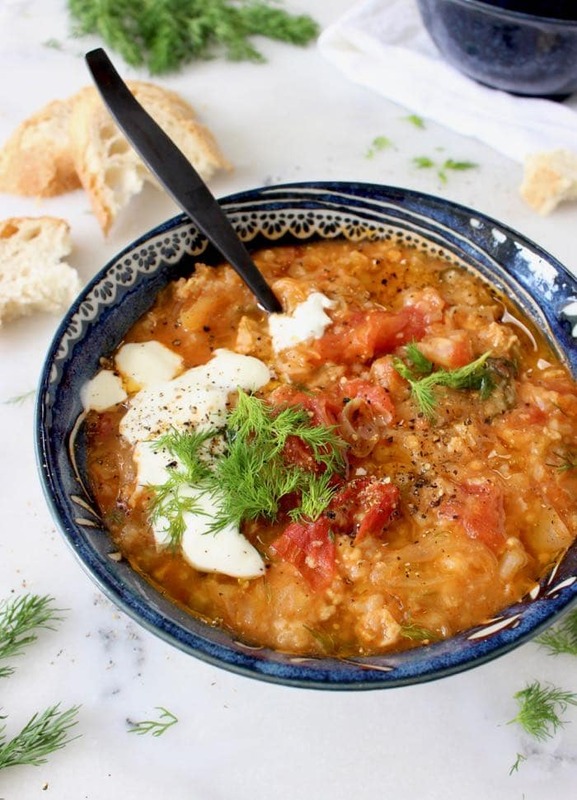 I could totally see myself cosying up on the couch on these cold Autumn evenings watching an episode of Hell on Wheels with a bowl of this in my hands! Gorgeous recipe idea! Thanks Elizabeth, hope you give it a go soon! This is absolutely fabulous! I am going to make them this weekend. Where have you been all this while Florentina!!!! This is what i was looking for. It’s the perfect rainy day dish making me say yyuuuummmm…..!!! I just completely loved this dish.It’s so easy as I don’t have to stuff in that cabbage. Right over here haha ! So glad you loved it, I love how easy it is to make, no stuffing and rolling the cabbage and it is so delicious with wild mushrooms instead of chicken too. Everybody wins! We so enjoyed this soup. We cut the caraway amount in half and that was just right for us.